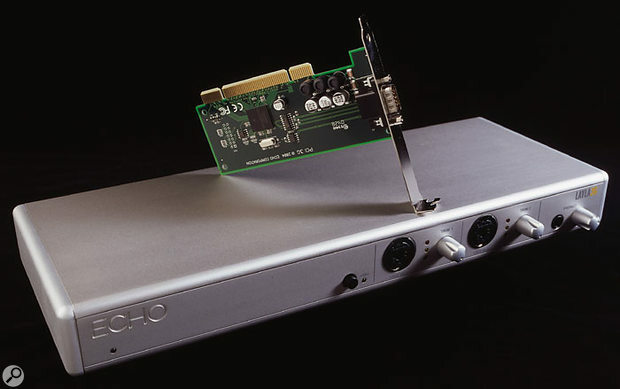 Echo's range of computer hardware has always been popular with musicians, and the company have now launched the 'third generation' of their Layla and Gina multi-channel audio and MIDI interfaces. When it comes to selecting an audio interface for a computer-based recording system, musicians now have a bewildering choice. As outlined by Martin Walker in his November 2004 article on this very subject, there is something for almost everyone, whatever the combination of features required and cash available. For those seeking multi-channel audio, digital I/O and MIDI I/O in a single device, at the upper end of the market, the current crop of products is particularly tempting. For example, in recent months SOS has looked at several Firewire-based units including the Digi 002 Rack, MOTU 828 MkII, RME Fireface and Yamaha i88X, all of which are very impressive. Of course, not everyone can justify spending £800-plus on an audio interface. Fortunately, whether PCI, USB or Firewire-based, there is also a range of mid-priced products available that are snapping at the heels of their more expensive peers. Echo have always had a good reputation in this particular area, and their Gina, Layla and Mia devices have all received positive SOS reviews in the past. Echo are now shipping the '3G' (third-generation) versions of the Gina and Layla, priced at £330 and £430 respectively. So how does the performance of the Layla 3G, which on paper looks well specified, compare to its more expensive competitors? Eight analogue inputs: two Neutrik Universal connectors for balanced TRS or XLR and six balanced TRS connectors. 48V phantom power on XLR inputs. Eight analogue outputs on balanced TRS connectors. Nominal I/O level: +4dBu or -10dBV (software configurable). Converters: 128x oversampling converters, 24-bit data resolution maintained throughout signal path. S/PDIF digital I/O: up to 24-bit resolution via optical or co-axial connector. ADAT digital I/O: 24-bit I/O over optical connection, 44.1kHz and 48kHz sample rates supported. Word clock I/O. Can sync to MTC (MIDI Time Code). Headphone output: high-quality quarter-inch headphone jack with volume control on front panel. On-board 56-bit, 100MHz Motorola DSP. Buss-mastering PCI host interface provides power to breakout box; 3.3V and 5V compatible. Works with PCI-X and Power Mac G5. In essence, the Layla 3G is a PCI-based interface with a neat 1U rackmounting breakout box, offering an eight-in/eight-out analogue configuration with additional digital I/O (a further eight channels of I/O using the ADAT connectivity). The front panel of the breakout box itself is rather minimalist in appearance, with just a power LED, two combi XLR/TRS inputs with input controls and three-stage LED metering, a phantom power switch and a headphone output with volume control. The XLR/TRS inputs are 'smart' and will automatically adjust for a line, mic or high-impedance input signal. Commendably, Echo provide a decent 15-foot cable for connecting the PCI card to the rack unit. This also supplies power so, thankfully, there is no wall-wart power supply to deal with. The Layla 3G Console. The rear of the unit contains all the other connectivity. This includes the other six balanced analogue inputs, eight balanced analogue outputs, stereo S/PDIF I/O (RCA or optical) or eight-channel ADAT optical I/O, word clock connectors and MIDI I/O. One further interesting feature is the two insert jacks, which function with the two front-panel inputs and allow external effects to be easily patched into these input channels. The lack of dedicated inserts on the majority of audio interfaces (and even many digital mixers) can be frustrating for those used to their availability on most analogue desks. Audio interface manufacturers now seem to be addressing this — for example, Yamaha's i88X includes inserts — and it is very welcome to see them appearing in a mid-priced unit like the Layla 3G. As well as the PCI card, breakout box and cable, Echo also supply a Quick Start Guide and a single CD. The latter contains all the drivers (both PC and Mac) and the full manual as a PDF. Unlike many manuals supplied with hi-tech computer equipment, this one is actually helpful. It includes a range of supplementary information on, amongst other things, the principles of digital audio, different driver types and surround sound. For the less experienced user, this would make interesting reading. 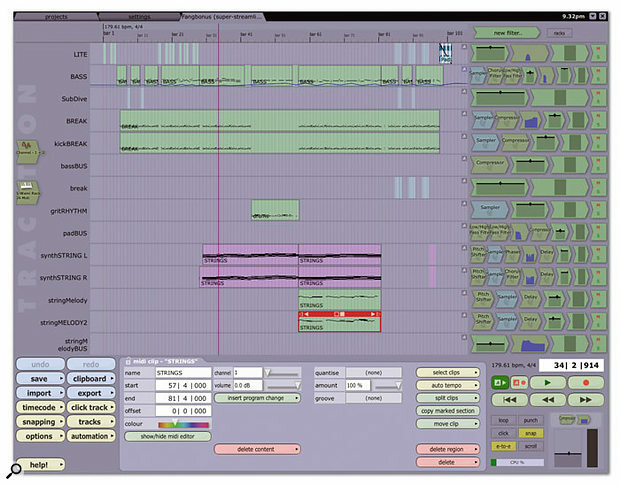 Also included within the package is Raw Material Software's Tracktion MIDI + Audio sequencer. Now marketed by Mackie, Tracktion was reviewed in SOS April 2003 so, aside from the summary in the 'Extra Atracktion' box, interested readers could refer to the earlier review. Installation of the Layla 3G proceeded without a hitch. Once the drivers were installed on the Windows XP test system, the PCI card was simply slotted home, the breakout box connected and, on power-up, the PC found the Layla 3G and the necessary drivers with little user intervention required. PC: Windows Me, 2000 or XP, Intel Pentium or AMD Athlon CPU, motherboard with Intel, AMD, Via or NVIDIA chip set, 256MB RAM (512MB recommended). Mac: Mac OS 10.2 or later, G4 or better processor, 256MB RAM (512MB recommended). Given the very creditable performance of Echo's previous audio products, I was not surprised to find that the Layla 3G sounded very good indeed. Some basic listening tests using a range of commercial recordings, and performed via Sound Forge and Wavelab, demonstrated plenty of high-end detail and solid reproduction of the lows. Stereo imaging also seemed to be very good. These subjective comments were supported by more objective testing with Rightmark's Audio Analyser (5.4). Loopback tests at 16-bit/44.1kHz gave noise levels of 95.8dB(A), total harmonic distortion (THD) of 0.0011 percent and stereo crosstalk of 98.7dB, all excellent figures. At 24-bit/44.1kHz, these improved further to -110.2dB(A), 0.0008 percent and 114.6dB respectively. Again, these are excellent figures, and the noise and stereo crosstalk readings only dropped by a couple of dB at 24-bit/96kHz. All other things being equal, and all other elements of the audio signal chain being taken due care of, I'd have no concerns about using the Layla 3G for serious audio work. If the Layla 3G appeals, but you could manage with a two-in/six-out analogue configuration, then the Layla's little sister, the Gina 3G, might fit the bill. Aside from the reduced analogue I/O count and a smaller box, much of the functionality remains the same, including the two, phantom-powered, Neutrik Universal 'smart' connectors for balanced TRS or XLR on the front panel. The only other noticeable differences are the lack of word clock I/O on the Gina and a shorter (8-foot) cable to link the PCI card with the breakout box, and the £329 price tag still makes it a very attractive option. 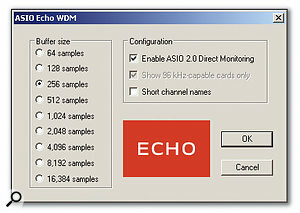 The Echo Console application is used to control the main functions of the interface. The key features of the Console are similar to those found in earlier versions (for example, the Indigo IO, reviewed in the April 2004 issue), although the exact details obviously reflect the particular hardware configuration of the Layla 3G. 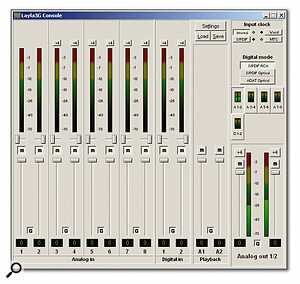 The main screen is dominated by faders and meters for the eight analogue inputs. On the surface, this is all quite straightforward, but as only a single analogue output buss is displayed within the Console at any one time and different input channel monitoring settings are available for each analogue output buss, things can get a little more complex. Fortunately, the manual does a decent job of explaining this and, as you could use this feature to set up different input monitoring mixes for each of the analogue output pairs, it does provide considerable flexibility. The user can toggle between the settings for each of the output busses via the buttons located mid-right of the window. Immediately above these, the Input Clock and Digital I/O formats can be selected. 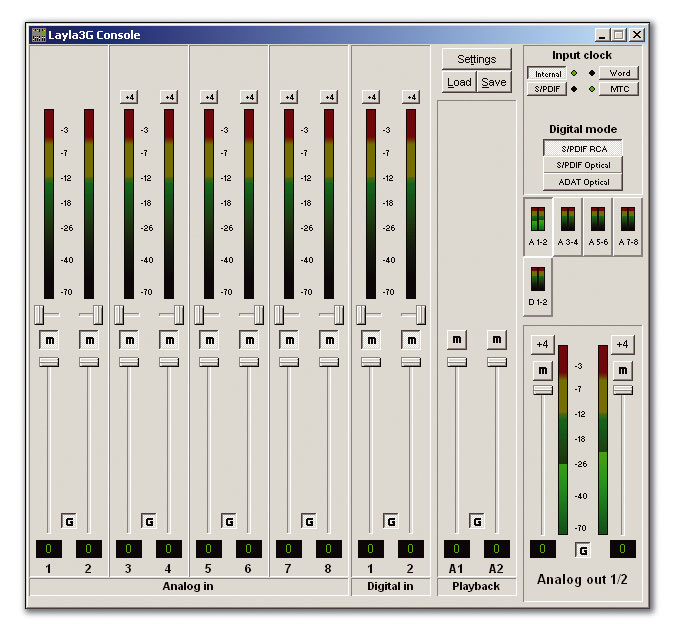 The Settings options include the channel delay screen for use with a surround monitoring system. The settings button opens up further options, all of which will be familiar to existing Echo users. These include setting the S/PDIF format, GSIF buffer size options (on the PC) and, usefully given the multi-channel outputs, the ability to set up channel delays to accommodate a surround-sound monitoring system. Conveniently, users can also save and load particular Console settings if they regularly use different configurations for different audio applications or tasks. Of course, audio quality is not the only requirement for a good audio/MIDI interface: driver stability, reliability and low latency are also required. Again, Echo have an enviable reputation in this area and the Layla 3G proved to be no exception. The performance of the ASIO and WDM drivers seemed both stable and efficient (I don't have Gigastudio on my test system, so couldn't evaluate the GSIF drivers). In both Cubase SX and Reason, I was able to get down to a buffer size of 256 samples (equating to a latency of around 6ms) without a great deal of CPU sweat even in a fairly busy arrangement. Lower settings also worked fine but, of course, generated higher CPU loads on the test PC and, frankly, given my keyboard skills (or lack of them! ), I've never been that concerned about the difference between a 3ms or 6ms latency when using software synths. Playback and recording worked as expected within both Sound Forge and Wavelab. I was also able to configure both SX and Acid Pro for 5.1 surround sound output without any difficulty. In testing, I experienced no problems at all with the hardware itself. In performing some routine recording tasks in SX, the analogue inputs and outputs behaved exactly as expected. I carried out my usual solo voice and acoustic guitar recordings via the front-panel mic preamps using a couple of different condenser microphones (one budget, one less so). Starting at 16-bit, 44.1kHz, the results were extremely pleasing — clean and seemingly accurate — while moving to 24-bit produced a subtle improvement in the high-end detail. I didn't notice any obvious further improvement when moving to a 96kHz sample rate, and in truth, most people considering an audio interface in the £400-500 price range are unlikely to have spent the considerable sums required on mics, monitors and acoustic treatment to get a significant benefit from high sample-rate recording — but the choice is there if you need it. Recordings made via the line-level inputs 3-8 were also clean and clear. While they do not provide phantom power, they would be perfectly suitable for use with hardware synths or for multi-mic recordings of a live band (either using dynamic mics or feeds from an external mixer). The usual buffer size settings are available via the Control Panel directly from SX. As on previous Echo products, the Layla 3G drivers support multi-client audio. Providing you are careful in how you set this up (and the host computer is powerful enough! 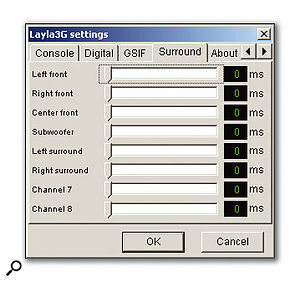 ), it ought to be perfectly possible to run several audio applications in tandem, each using a different set of the Layla 3G's outputs with a different driver format. Again, the PDF manual contains some useful information on this topic, covering common applications such as Sonar, Gigastudio and SX. The ASIO 2.0 Direct Monitoring function of the Echo worked well within SX, making latency a non-issue when recording real instruments via a microphone. The inserts on input channels 1 and 2 also did their job without a fuss, making it feasible to patch in the occasional outboard effect/processor unit in the absence of a hardware mixer. Finally, while I was not able to test the ADAT I/O connectivity, the S/PDIF I/O passed data to and from other digital devices in my studio without any problem. If I had to criticise the Layla 3G, two things would occur to me. First, the three-stage LED front-panel input metering is perhaps best described as 'basic', although more detailed information can be obtained via the Console. Second, I found the lack of a front-panel control for master output level to be a bit irritating. This would, of course, be less of an issue if the Layla 3G was permanently wired up to a hardware mixer but, for those trying to manage without a mixer, audio levels have to be controlled via your host application or the Console. Given both the price point and the unit's audio performance, these are, however, very minor quibbles. As a PCI-based interface, the Layla 3G may be less appealing than a USB or Firewire-based device to those who might want to adapt to laptop use in the future. However, if you're looking for something to slot into a permanent studio setup featuring a desktop PC or Mac, it certainly has plenty to offer. In this context, the only major problem with the Layla 3G is that it gives musicians yet another multi-channel audio and MIDI interface to choose from! The third generation of the Layla line is most certainly up to Echo's usual standards and is capable of very good results. It is likely to have fairly wide appeal amongst the serious home/personal studio crowd — while many in this position might aspire to something like the Digi 002 Rack or MOTU 828 MkII, unless the other elements of the studio setup are all as well specified, it is debatable whether the extra few hundred quid would generate noticeable audio improvements for many users. The Layla 3G provides a very functional audio and MIDI interface and is backed by Echo's strong history in delivering stable and efficient drivers. At this price point, I expect it to sell very well indeed. I reviewed Tracktion back in the April 2003 issue of SOS. While the software has undergone various updates since that time, and is now available for both Windows and Mac OS, its basic operation remains the same. Tracktion: not your average MIDI + Audio sequencer! As described in my original review, Tracktion 's author, Julian Storer, decided to approach the issue of MIDI and audio sequencing from a very different perspective to more mainstream applications. As a consequence, those with experience of Sonar, Cubase or Logic (for example), might find Tracktion a little left-field to start with. This said, the intentionally stripped-down feature set makes for a very efficient learning curve and it offers a perfectly functional sequencing environment. Bundled free with Layla 3G, it ought to be a very welcome addition for someone just starting out with computer-based recording. Builds on Echo's good reputation for audio and MIDI products aimed at musicians. Input metering on front panel somewhat basic. No hardware control for output level. Given Echo's well-earned reputation for their audio/MIDI interface products, it would be expected that the 'third generation' version of the Layla ought to do the business straight out the box. It doesn't disappoint — with this combination of features and price, the Layla 3G ought to have wide appeal.